Welcome to where comfort meets contemporary living. It offers affordable and elegant accommodation for families, couples and singles. 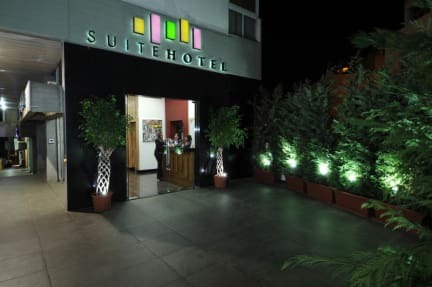 The Suite Hotel Merlot has 42 large rooms/suites divided into 3 categories – Executive Suite, Junior Suite and Standard Room. A Bar and Restaurant are available for our guests at our sister property Suite Hotel Chrome across the road. We offer free parking, currency exchange and business centre facilities. Airport shuttle available at additional charge. 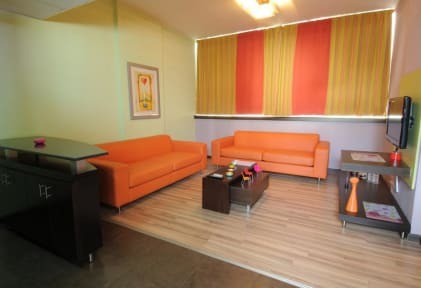 All suites have lively colours and a joyful mood, they are furnished with comfortable beds, large relaxing couches and all the necessary amenities. They are tastefully decorated in a modern and stylish design. With independent air-conditioning system, with climate control, direct dial telephone, satellite TV and 24-hour front desk service. In-room Wi-Fi, hairdryers, iron and board are available upon request. All suites have large modern bathrooms, kitchenette with work bench and refrigerator. The suites also have large closets with clothes hangers and drawers. Electro-magnetic cards provide secure access and control the electricity in every suite. Facing St. Georges Square, Jal El-Dib, Beirut, Lebanon Suite Hotel Merlot is located in a central location to every area and destination in Lebanon. It is about 10 minutes’ drive from the Beirut Central District, and 15 minutes from the airport. It is also central to all tourists’ attractions in Lebanon, from Tyre, Saida, Beiteddine, through Beirut and Jeita to Harissa, Jounieh, Farayya, Byblos, Tripoli and the Cedars. It is only few minutes away from the Damascus highway. Taxes not included - 10.00% tax will be added.